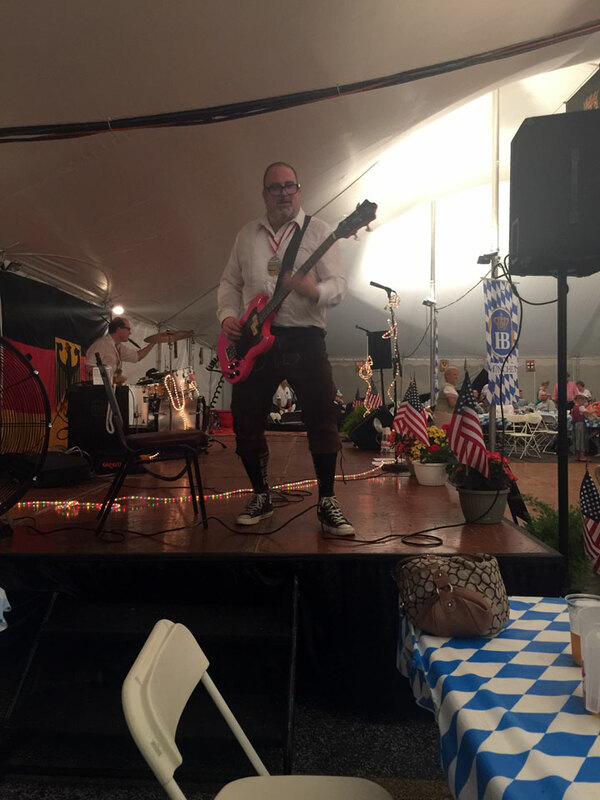 As always, we kicked off this year’s season with Oktoberfest in August, sponsored by Schwaben Verein of Chicago. Located in Buffalo Grove, IL, this ‘fest has a community feel, complete with local vendors and tons of townspeople. 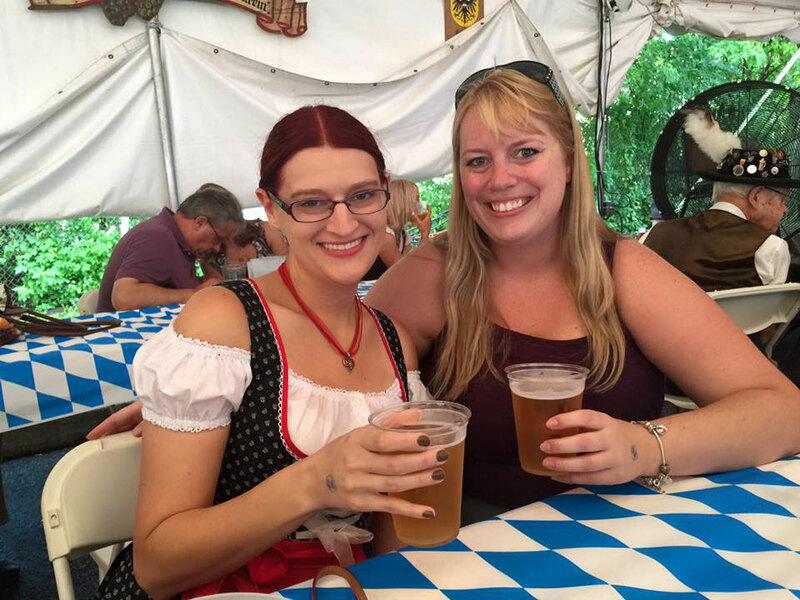 Blending domestic comforts with some authentic German flair, Oktoberfest in August is a nice hybrid event that helps us seamlessly transition from backyard barbecues into Oktoberfest season. At $10, admission for the event is a little more than we’d like to spend just to walk through the gate, but free parking is a nice perk to balance out the cost of admission. Kids under 12 are also free, which would be a nice perk if we had kids under 12. We grabbed a couple of pretzels and a pitcher of authentic Hofbräu München (quite reasonably priced at $14, we should note) and settled in for the night at a table near the stage. We had worried about the heat - it was August after all - but they had set up large fans that kept the tent at a comfortable temperature. 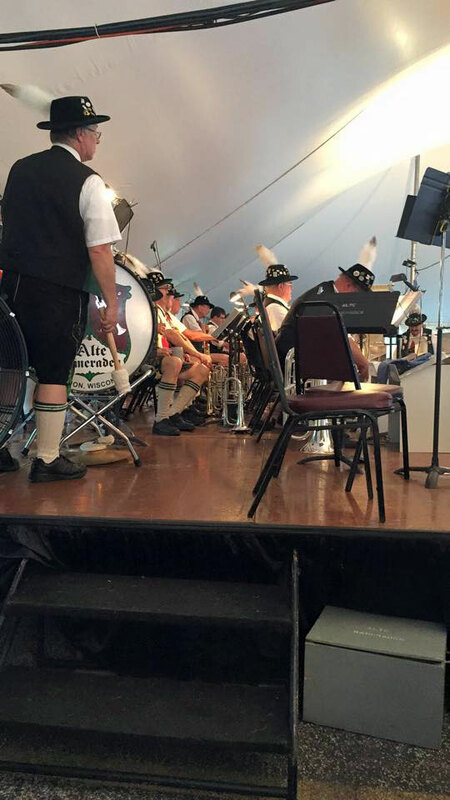 Entertainment was already in full swing, and we were thrilled to grab a spot so close to the Alte Kameraden Band. The other attendees were equally impressed by the German music and the traditional dancers who accompanied the band. Not long after we arrived, a snake dance was announced, and many people - including Backyard Oktoberfest’s own Scott - were happy to join in. However, the downside of such engaging entertainment is that we ended up missing the keg tapping entirely. We were expecting a formal announcement, but there wasn’t one. The scheduled time for the keg tapping came and went without any additional fanfare, which was a disappointment because we specifically came that day to check it out. In the future, we would recommend/appreciate a formal announcement or some other way of catching people’s attention. The keg tapping is an important part of any Oktoberfest celebration, and we were bummed to have missed it. 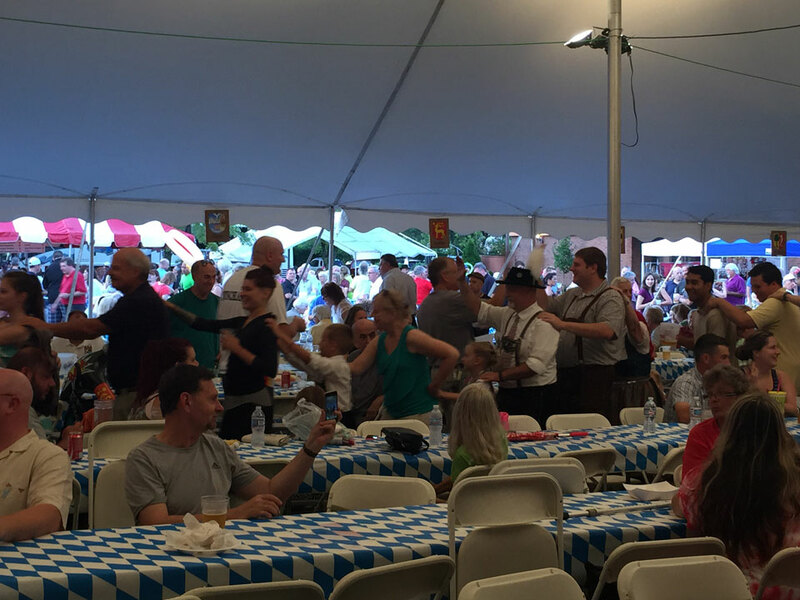 The food and beverage offerings at Oktoberfest in August are a bit of a mixed bag. They serve plain hot dogs, blooming onions, and nachos in addition to traditional German offerings such as leberkäse, thueringer, and landjaeger. In a similar blend of the domestic and imported, they serve Miller Lite as well as Hofbrau München and hefeweiss. We at Backyard Oktoberfest have mixed feelings about this menu. We recognize that some attendees might be scared off by exotic menu items, so it’s nice that they offer some carnival-type foods for less adventurous diners. But at the same time, we like to strive for cultural immersion at events like these. You can get nachos anywhere; you can only get landjaeger at Oktoberfest. That said, after several pitchers of beer, we did find ourselves in line for nachos only to be bitterly disappointed when we learned that they had sold out. We ended up with a blooming onion, which unfortunately suffered from an unbalanced ratio of onion to bloom. We learned our lesson. Next year, we’ll stick to traditional Oktoberfest foods. By the time the Polkaholics took the stage at 8:00, the crowd had already started clearing out. We have a couple of theories about why this happened. It could be that most of the attendees had been there since the gates opened at 1:00, so they had already put in a full day of Oktoberfest-ing. Alternatively, it could be that the patrons of Oktoberfest in August are not a late-night bunch. Many of the attendees fell into the over-50 set, and as much as we hate to generalize, maybe high-energy polka just isn’t their jam. The Polkaholics are a rockin’ good time, but it is a stark shift from the more traditional German music that started the evening. We’re big fans of the band, so we were glad to see them play, but it would have been nice if more people had stayed through their set. 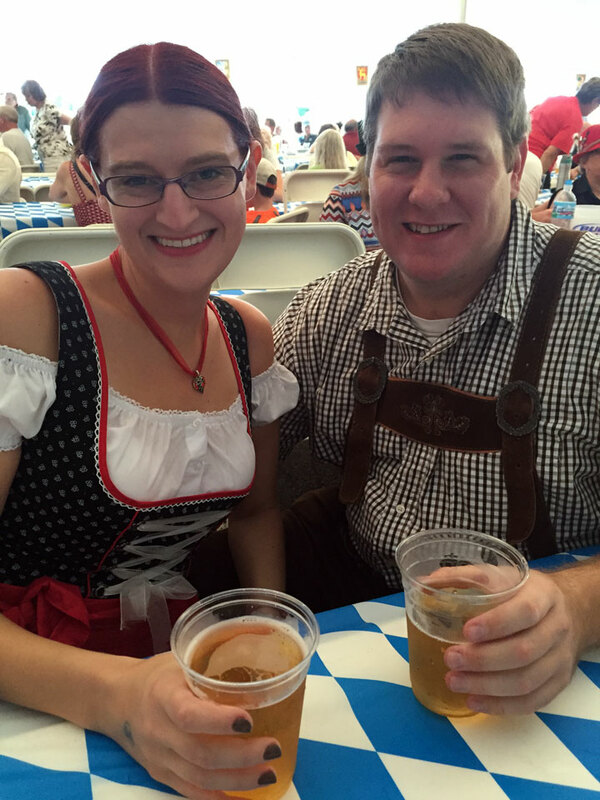 Overall, Oktoberfest in August is a fine event. It’s not the most authentic event we attend, but it’s always a fun time with a good-natured crowd. We’re always excited to check it out.